It’s summer, it’s Britain, it’s raining. 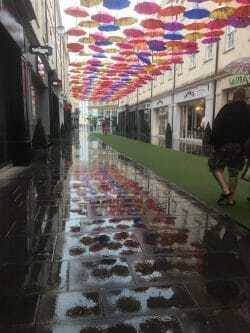 Hardly an unusual combination, but this summer, Southgate in Bath is once again sporting it’s summer clothing of multicoloured umbrellas. This year, the umbrellas are all flower patterned, the handles are green and it truly is a garden in the sky; the fake grass underneath helps with the garden illusion too. Bath has a history of these sorts of installations, most memorably, the red, white and blue painted bicycles that were in the same location for the ‘Tour de Britain’ a couple of years ago. 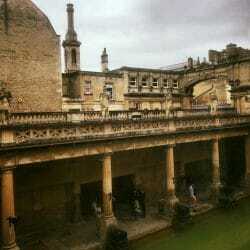 No trip to Bath is complete without a visit to the Roman Baths. The archeological site has been much extended in the last 18 months and you can now walk over the old temple precinct which would have been adjacent to the Baths. 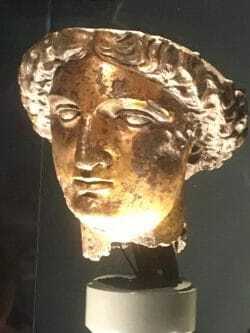 Sulis Minerva’s golden head is one of the highlights. She’s missing her ornate helmet but her head is now nearly back where it would have been while the Romans were still using the site. The handheld guides have been updated to include the new part of the site but be warned, when the weather is really bad, you cannot access the viewing gallery/rampart over the grand bath, it’s simply too slippery and the doors will remain closed. One benefit of that, though, is that you can actually get a good view of it without lots of people in the way! Despite the rain, we highly recommend a walk up the hill towards the Circus and the Royal Crescent. The Georgian architecture is beautiful in any weather. We recommend using our Bath Pop Out map to navigate around, it’s compact when folded and easily fits into a pocket.